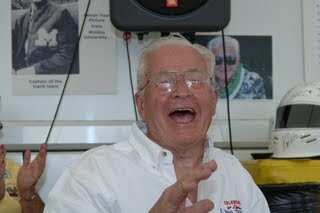 On May 25, 2006, “The Speedway Six” hosted The 90th Running of Doc for his 90th birthday. The Speedway Six are a group of six friends (the group that sits up front at Don Kay's Autosport Radio Show), who do a lot of things for people just because they like too... In the program for ‘Doc’s party, the following excerpt of Hoyt’s life story was told as follows. E. Hoyt “Doc” Kerr, Jr. was born June 8, 1916 in Mechanicsville, Iowa and he was named after his father Ezra Hoyt Kerr, who was a Dentist. His mothers name was Ruth Buffington and Hoyt had a brother, Lionel McPherson Kerr. Hoyt graduated from Mechanicsville High School in 1934 where he was known as Junior Kerr. He attended Miliken University in Decatur, IL between 1934 - 1939 and majored in Philosophy. His family moved to Decatur during that time and his parents remained there til their deaths. Hoyt met his bride to be, Frances North, at Miliken and they were married shortly after graduation. Their first and only son, David, was born in Tulsa, Oklahoma, with their three daughters Judy, Patricia, and Kathy being born in Clarksville, Arkansas. The Kerr family lived in Clarksville in the late 40's and early 50's where Hoyt was the Pastor of the First Presbyterian Church at the base of the Ozark Mountains. It appeared he was associated with the College of the Ozarks. (Having previously graduated from the McCormick Seminary) In the late 50's, early 60's the family moved to Newark, OH where Hoyt was the pastor of the First Presbyterian Church. Then in 1967 they moved to Troy, MI. Where it’s believed he sold insurance for several years before going to work for the Bradford Scott Corporation (BSC) to manage their office and operations. BSC sold real estate in Michigan, and then bought 1600 lots in Indiana known as Heritage Lake. Hoyt moved to Indy in 1977 to work for BSC at Heritage Lake, before he was given a gold Rolex watch upon retiring from BSC in 1988. Hoyt was then introduced to Hemelgarn Racing thru Dennis Weeks and Ron Burton and has worked for the team ever since. He was a Crew member on the Team’s 1996 winning Indy 500 entry. 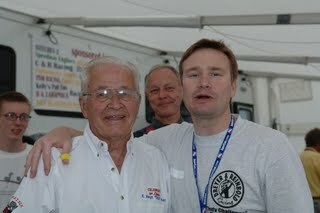 Although I didn’t know ‘Doc personally, I briefly knew of him via the World Wide Web thingy, a.k.a the internets, as he was a regular fixture (like many) at Donald Kay’s Autosport Radio Show which I was introduced to upon my visiting the Speedway in 2007. Thus, it seemed like Don would have some sort of ‘Quip to say about ‘Doc almost every “radio” program. (Weekly...) And although I never saw him on the webcast, nevertheless I knew he was there and the Elder Statesman of a lively group of regulars. I’m told that during Sunday’s Sao Paolo Indy Car race; at 1PM ET, Friends & Family stopped to raise a toast to Doc. When Dave told ‘Doc’s son David at the funeral how I’d appreciated him coming up and meeting me after my big interview, he said: "That's how dad was. He wanted to make everyone feel good."